Palin's also facing questions today about the 55 grand she charged Alaska taxpayers so her family could travel with her to events the past two years. Alaska law is vague, but when it comes to the clothes, the campaign is crystal clear. After the fashion faux pas came to light, they announced that all the pricey duds would go to charity. What a day it's been for the McCain-Palin campaign. The story about her wardrobe broke overnight. $150,000 worth of clothing from top retailers, for Palin and her family, clothing that was bought with Republican Party funds. The campaign says the clothes will be donated to charity. REYNOLDS: This afternoon, the Early Show's Harry Smith asked Obama about McCain's campaign tactics that have drawn criticism even from some Republicans. 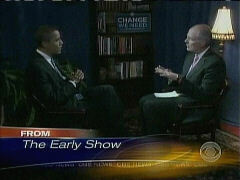 BARACK OBAMA, IN EARLY SHOW CLIP: “Pals around with terrorists.” I mean, just the kinds of stuff that, that I can't imagine saying about an opponent of mine. REYNOLDS: Obama says he understands that politics is a rough business, but he insisted there is no equivalence between his campaign tactics and John McCain's. In other news, Gordon Smith of Oregon today became the fourth Republican to urge John McCain to stop those robo-calls to people's homes linking Barack Obama with William Ayers. Smith is a Republican U.S. Senator is a tough re-election race. Neither Reid, nor Reynolds before him, had uttered a word about robo-calls mentioning Ayers. KATIE COURIC: Meanwhile, Sarah Palin may think the world of Joe the Plumber, too, but that doesn't mean she intends to dress like him. 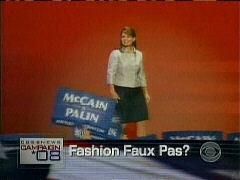 In fact, the Republican Party has spent $150,000 on Governor Palin's wardrobe, something that may not square with her image as a down-to-earth every woman. Here's Nancy Cordes. SCOTT THOMAS, FORMER FEC CHAIRMAN: I would be the first to tell you, public relations-wise, it is a mess. CORDES: As it was for Hillary Clinton, when her $3,000 hair stylist bill came to light, or John McCain with his $520 Italian loafers. 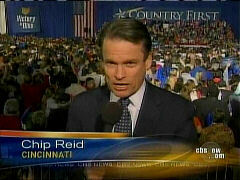 Or John Edwards, whose $400 haircut spawned satire online. Candidates have a tough needle to thread, says Maxine Risik, who has been dressing Washington power women for 58 years. MAXINE RISKIK: They do need to spend some money. CORDES: Does it have to be $150,000 for three months? RISIK: You can do it for less, much less. Yes. 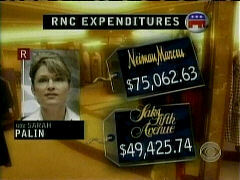 CORDES: Palin's also facing questions today about the 55 grand she charged Alaska taxpayers so her family could travel with her to events the past two years. Alaska law is vague, but when it comes to the clothes, the campaign is crystal clear. After the fashion faux pas came to light, they announced that all the pricey duds would go to charity. Nancy Cordes, CBS News, Washington.